Brisbane is one of only two Australian capital cities where rents for detached houses increased by more than rents for apartments over the last 5 calendar years. Apartment rents have increased more than houses in 6 out of 8 capital cities over the last 5 years. 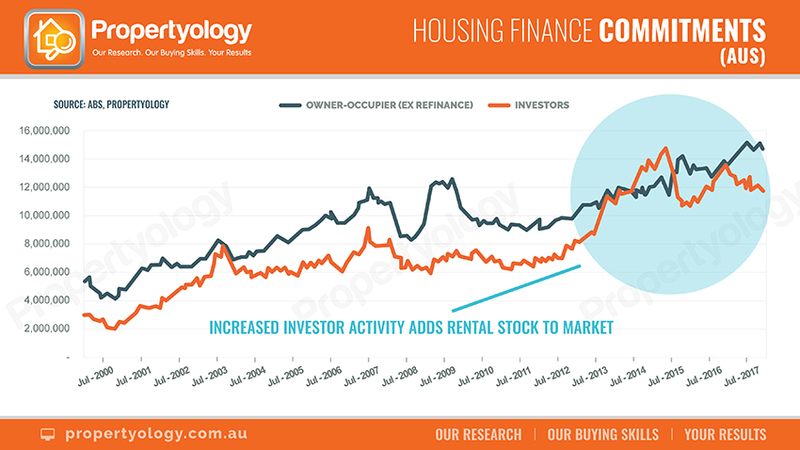 Analysis conducted by Propertyology looked at the historical trend of capital city rents between 1997 and 2017. Our research project broke the twenty-year period in to four blocks of 5 calendar years. Across each of the 5-year blocks, Brisbane property prices increased by 40 per cent over (5YE 2002), 112 per cent (5YE 2007), 9 per cent (5YE 2012) and 20 per cent (5YE 2017). There is a correlation between rental price growth and wage growth. In the 5-years ending 2007, Brisbane property rents increased significantly (50 per cent growth for houses and 64 per cent for apartments). 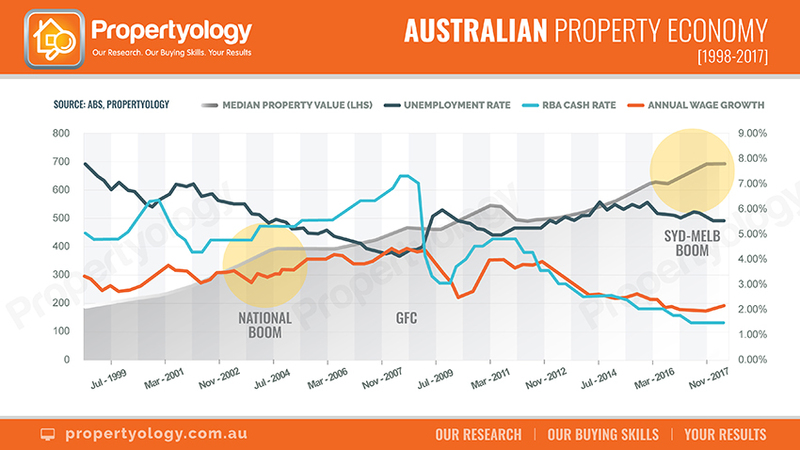 This period also produced the highest wage growth while property prices more than doubled within this 5-year block. Queensland wage growth for the 5 years ending 2017 was significantly lower than other period as was Brisbane’s rental growth. According to Census 2016, 76.4 per cent of Brisbane’s 901,797 dwellings are detached houses (significantly higher than Melbourne and Sydney, 67 and 57 per cent respectively). The proportion of Brisbane households that rent mildly increased between Census periods, from 33 per cent (2011) to 34.5 per cent (2016). Housing affordability pressures in Sydney have contributed towards an increase in migration out of Sydney towards other affordable locations that include Brisbane. Propertyology anticipates that new interstate migrants are more likely to buy than increase rental demand in Brisbane. Brisbane’s economy has been underwhelming since the onset of the GFC in 2008. The resources sector downturn from late 2012 (adversely affecting Brisbane) was in contrast to a pick-up in the professional services sector (benefitting Sydney and Melbourne). Consequently, Brisbane’s population growth rate has been below 2 per cent per year since 2014, placing less pressure on rental accommodation than 5YE 2007 and 2012 when population growth was mid-high 2 per cent per year. Whilst investor activity in Brisbane was much lower than Sydney and Melbourne over the 5YE 2017, the volume of new rental stock was still more than adequate for demand. In fact, large pockets of Brisbane have seen rents fall (inner-city apartments) or remain flat (outer-suburb houses) for some years. All things being equal, Propertyology does not anticipate any significant pressure on Brisbane rents for the foreseeable future. Rental yields are however, stronger in Brisbane than many other capital cities. Rents in every Australian capital city have experienced the lowest growth in twenty years and, in some cases, have substantially declined.The 5-years ending December 2017 produced lower rental growth than all of the previous 5-year blocks in every capital city over the last 20 years. We keep hearing that wages haven’t grown much at all in Australia post-GFC and how that’s hurting households because cost of living has increased. 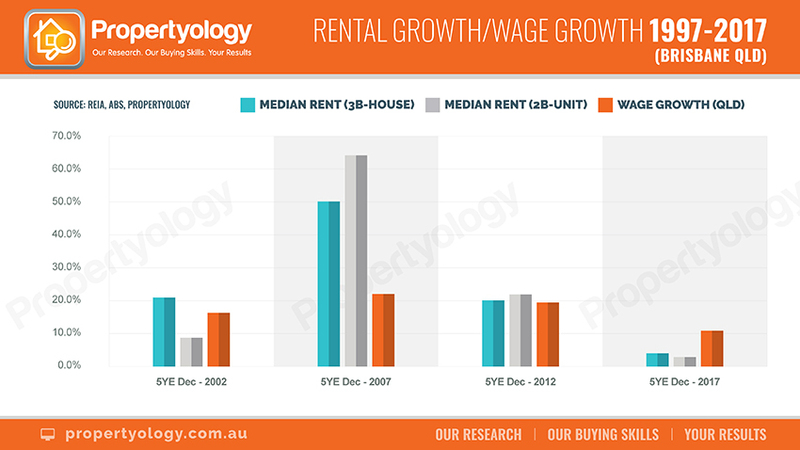 Propertyology’s research concluded that there is a direct correlation between rental growth and wage growth. Unprecedented growth in investment lending over the 5 years ending December 2017 and the resultant extra supply of rental stock (predominantly in Sydney and Melbourne) has also played a significant role in suppressing the growth in rental prices. Right across Australia, rents have barely moved over the last 5 years. In fact, rents for 5 out of 8 capital cities have varied by less than 5 per cent over the entire 5-year period. The role that mum-and-dad investors have played in increasing Australia’s rental stock has been very important for household budgets at a time when wage growth is at a 20-year low. Over the 20 years in total, capital city rents have increased by between 83 per cent (Darwin) and 166 per cent (Canberra). Sydney (155 per cent), Hobart (146 per cent) and PerthPerth, TAS Perth, WA (141 per cent) were among the highest. Brisbane (130 per cent), Adelaide (126 per cent) and Melbourne (109 per cent) were among the lowest.